Hello, my name is Karen Maxwell from Lisnaweary Quilts. I am just thrilled to bring you my first Moda Bake Shop tutorial. So everyone is back at school and lets face it, who doesn’t need a little encouragement to open the books and start studying? Use this tutorial to brighten up someone’s workspace! 1. 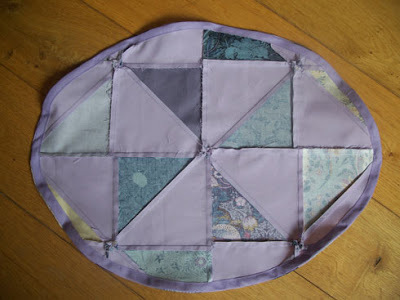 Take 16 of your favourite squares from the layer cake and cut out a 5 7/8″ square from each. 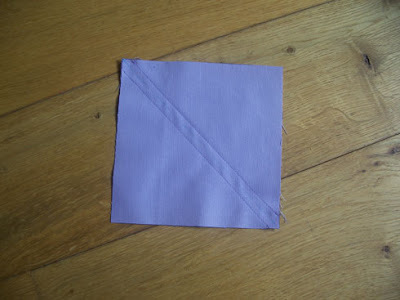 2.Cut 16 5 7/8″ squares from the plain fabric. 3. 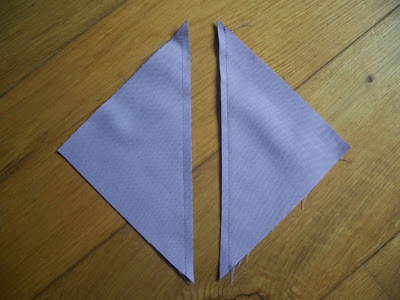 Half Square Triangles:Mark a diagonal line, from corner to corner, on each of the plain squares, using a watersoluble marker. The pen mark will be your sewing guide. 4. 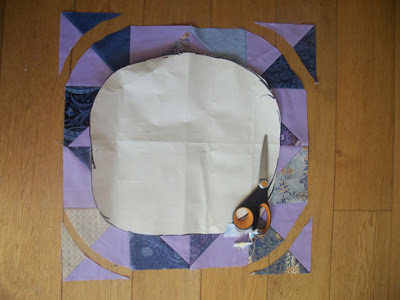 Place a plain square on top of a patterned square, right sides together. 5. 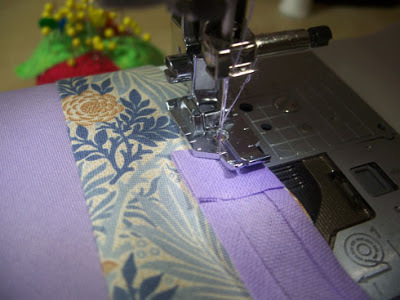 Sew a 1/4″ seam on both sides of the diagonal line that is marked on the fabric. 6. Cut along the pen line marked on the square. 7.Press the triangles open to give two squares. Trim off any the ‘ears’ at both edges of the square. 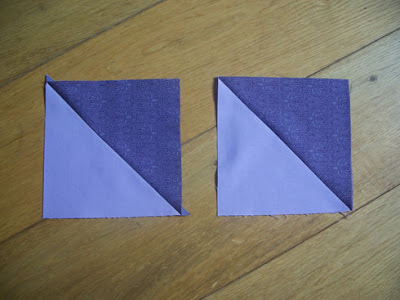 You should have 16 matching pairs Half Square Triangles (32 in total!). 8. 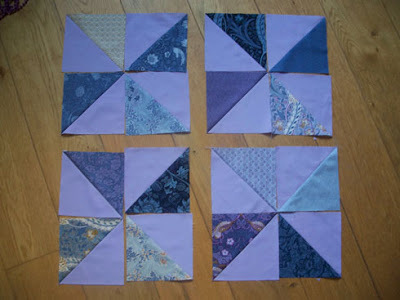 Take one of each fabric pattern and arrange Half Square Triangles in a 4×4 grid. Keep swapping them about until you are happy with the arrangement. Remember, the centre four will be the ones which will be seen on the on the seat. 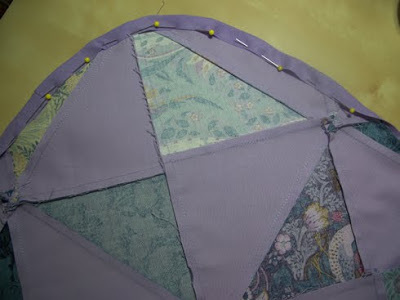 Sew the Half Square Triangles together. 9. 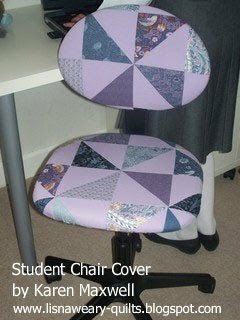 Make another 4×4 grid for the chair back, again swap them until you are happy with the arrangement! 10. 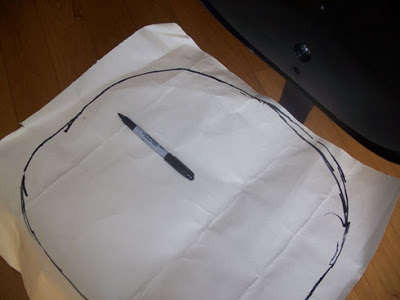 There are two choices when making the templates for the chair cover. 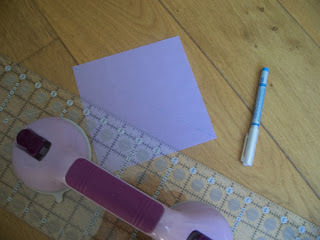 OR Place some heavy weight paper on top of the chair seat and using a felt tip pen, trace around the edge of the chair. Repeat for the back of the chair. Cut out template. 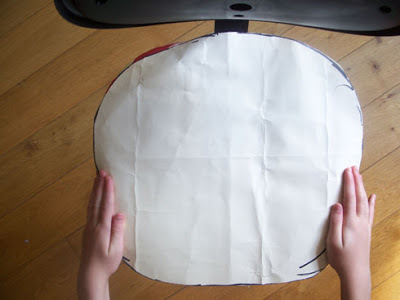 Place template on top of the seat to make it is the correct shape. Repeat for the back template. Add on approx. 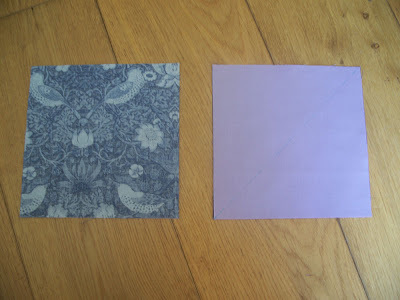 2″ around the edge of the templates for both the seat cover and the back cover. 11. To make the casing for the elastic, fold in 1/2″ of the end of the bias binding, place on top of the seat cover, right sides together. 12. 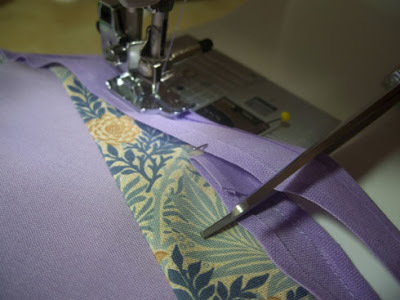 Using a scant 1/4″ seam, stitch in place around the entire seat cover, stopping 2″ from where the stitching was started. On the bias binding mark with a pin where the bias binding overlaps, cut off the binding 1/2″ from this pin. 13.Fold the binding back so that it meets the starting point, but does not overlap it. Sew in place. 14. 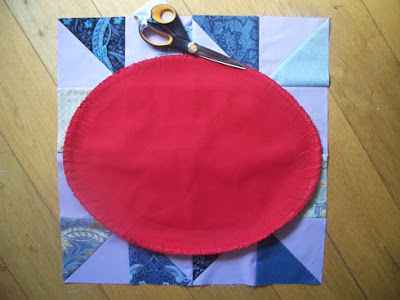 Fold the bias over onto the wrong side of the cover and pin in place. 15. 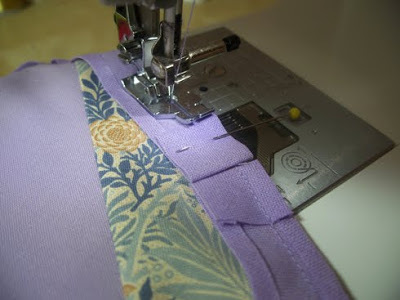 Sew around the inside edge of the bias binding to complete the elastic casing. 16. 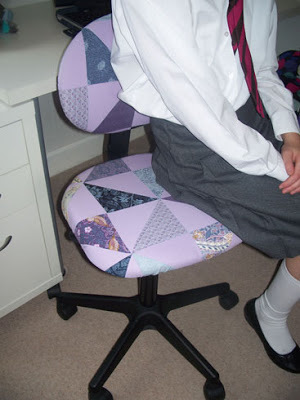 For the chair seat, cut a piece of elastic 22″ long and for the chair back, cut a piece 17″ long. 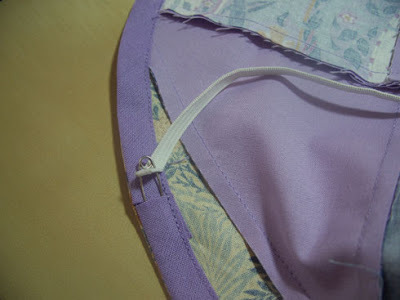 Place a safety pin on the end of the elastic and thread it through the casing. 17. 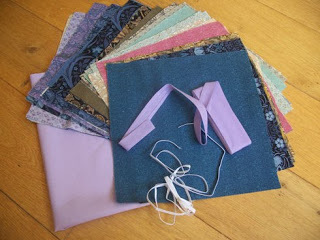 Pin the ends of the elastic on top of eachother and sew together to secure in place. 18. Fit the cover on the seat and the chair back. 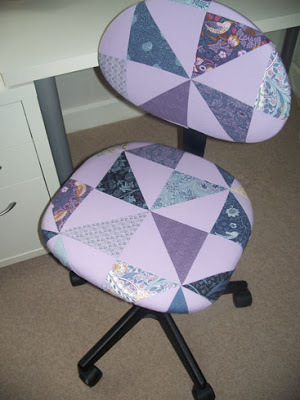 Centre the pinwheel in the middle of the seat and on the chair back. A bright and cheery chair cover! Sit back, relax and study! I hope you enjoy making this project, check out my blog to see it made in an alternative colourway. This entry was posted in Ambitious, Home Decor, Layer Cake and tagged A Morris Tapestry, Barbara Brackman, Bella Solids. ← That’s the Ticket Pillow!